This is a guest post by researcher Audace Dossou-Olory of Stellenbosch University, South Africa. Consider the following question: How many ways are there to connect $2n$ points on a circle so that each point is connected to exactly one other point? 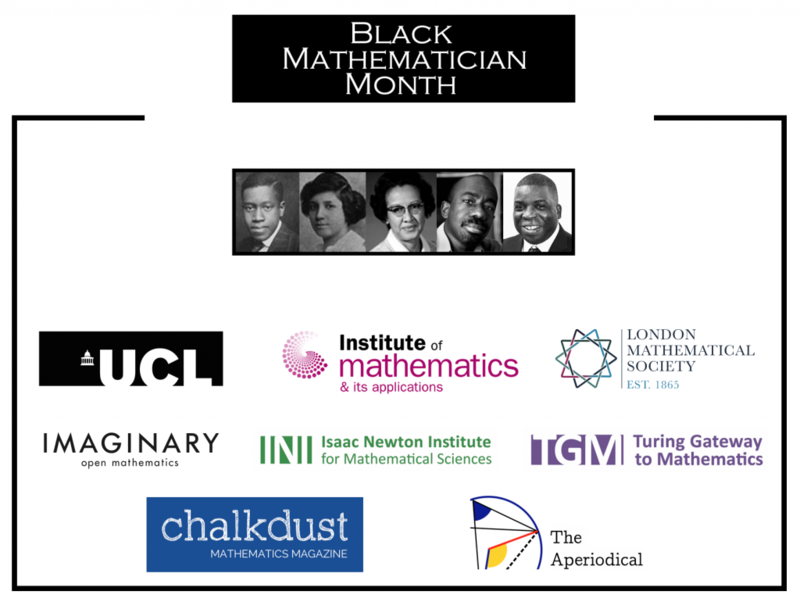 In October, The Aperiodical is participating in Black Mathematician Month. This article was written by Niki, Sean and Rafael from Chalkdust Magazine, which is also taking part. This October marks the 30th instance of Black History Month in the UK. The annual event, which was first celebrated in the USA in 1976, aims to highlight the ongoing struggle for equality and to educate people on the achievements of members of the African Diaspora. Of course there is plenty to celebrate, from both a historical perspective and in modern society. It is easy to reel off a list of black stars from football, athletics, basketball or cricket. The evolution of popular music has been driven by black artists, from Stevie Wonder and Aretha Franklin, to Kanye West and Beyoncé. The success of Lena Waithe at the Emmys and Moonlight at the Oscars shows the abundance of black excellence on screen, and the beginnings of recognition at the most prestigious award ceremonies. There are also increasing examples of mainstream success in areas such as literature and politics where, with a record number of black and minority ethnic MPs elected in the 2017 General Election, the UK parliament is more diverse than ever — although there is still a long way to go. Perhaps one reason why we don’t see many black mathematicians is due to the global economic disparity. When half the population of Africa lives on less than one dollar per day, pursuing a career in mathematical research might seem particularly unachievable. Indeed, enrollment in higher education in Africa is significantly lower than anywhere else in the world. Lassina Dembélé, a professor at Warwick University, found that growing up in the Ivory Coast he “didn’t hear much about mathematical research, [and] wasn’t really aware of the possibilities.” But income inequality also exists within the UK. Black people in Britain are more likely to live in poverty or be unemployed than white people, and in London more than half of those who live in low-income households are from ethnic minorities. There are known academic advantages associated with coming from a wealthy background, and since black and ethnic minority children are less likely to come from a well-off family, it is not surprising that there are fewer black academics. Racial equality should be a matter of concern for all of us. After all, what would our music be without the great Marvin Gaye or Gloria Gaynor? Where are the Barack Obamas and the Kofi Annans of mathematics? Imagine how much faster mathematics and the other sciences would move if everybody had a chance to make an impact, including those who are currently at risk of being pushed away because of the colour of their skin. Imagine all of the maths and science that we could be missing out on… the fight for equality is everybody’s fight. You will be able to read articles about, and written by, black mathematicians throughout October at Chalkdust and here at The Aperiodical. The project is additionally supported by University College London, the Institute of Mathematics and its Applications, the Isaac Newton Institute for Mathematical Sciences, the Turing Gateway to Mathematics, the London Mathematical Society, Imaginary, The Museum of Mathematics and Plus magazine. This article was written by Niki, Sean and Rafael of Chalkdust Magazine. The British Science Festival is organised annually by the British Science Association, and this year it’s hosted by the University of Brighton and the University of Sussex from Tuesday 5 to Saturday 9 September. For more details and full listings, see the main British Science Festival website. We’ve pulled out some of the mathematics-related events in the main programme – from theatre reproductions to puzzle workshops and plenty of talks and lectures, there’s something for everyone!